Yea, I will do that. Just have to fire up an older save when I get home as well. what does it say? I forgot to test this last version, I'll quickly get a fix when I get home. Yeah, I get the same error but I can't figure out what's going on. I didn't modify that BEGIN, to start with, so I dunno what it is complaining about. I'm going back to version 0.88, since v0.89 was fixing an error in the vanilla game… so I don't think I should be doing that, if it's not an error in the mod, and fixing it breaks the mod, I'll leave it out. v0.88 can be found here. I'll try v0.88 when I get home! Unfortunately the 0.88 version doesn't fix Yoshimo's constant banter. that should fix it (if it does, tell me, please). Haha, is that a promise? I'll test it once I'm home. Btw, should I uninstall the previous version before installing the new, or should I just install the new on top of? Which way is safest? However, I did notice a minor thing now that everything played out as they should. 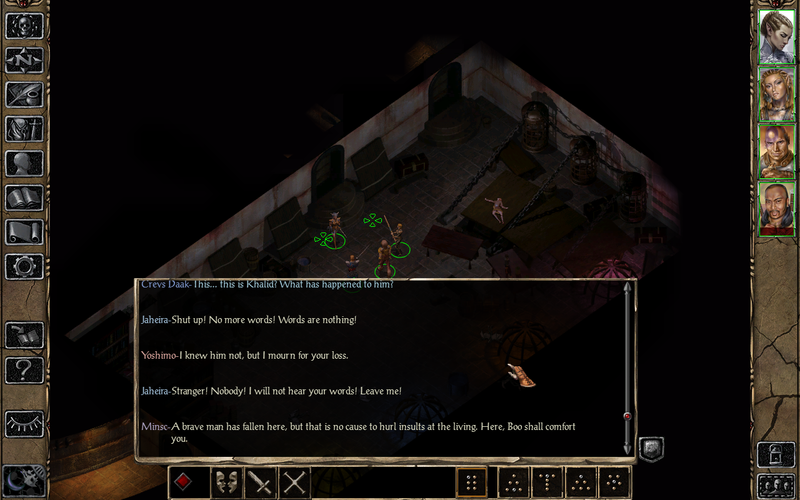 Yoshimo left my party at the inn, but immediately spawned and came running up to me from across the room saying I shouldn't return until I have Imoen. I make it a policy to always uninstall the previous version of a mod before installing the new version unless it specifically says its okay to do so. Safest way in my opinion. Ok turns out the issue I had here was definitely caused by the whatever was causing Yoshimo to spew out his I want to talk lines when he could not initiate dialogue. Jaheira kept repeating about Khalid's death because Yoshimo was unable to offer his condolences. Good news is that this is definitely fixed with the new version. Hello! I tried this mod last week and had the same problem as iavasechui; the new version fixed that, but all banter between party members has now stopped. Forcing with ctl+i made the other party members' banters fire, but Yoshimo's didn't; there was one with Jaheira that simply cut off when Yoshimo was supposed to have a reply. I'm at Spellhold now, hopefully everything goes smoothly... nope, it didn't. Yoshimo betrayed me as usual. all banter between party members has now stopped. Forcing with ctl+i made the other party members' banters fire, but Yoshimo's didn't; there was one with Jaheira that simply cut off when Yoshimo was supposed to have a reply. Do you have any other mods installed? Anyway Yoshimo has just one banter initiated by himself (with Mazzy), so I doubt it would be an issue, since he also has few banters. Which party members do you have in your party? Also, which reply was cut? the one to Khalid's death? Do you have a previous save I could use to check? I'd like to see what goes with that. Also, did he had other dialog options or did he just leave a la vanilla style of "sorry bro but I gotta kill you"? I tested the Jaheira reacting to Khalid's dead and Yoshimo's comment works fine. I have the following installed (digs out WeiDU log): Banterpack, IEP banters, Romantic Encounters, Haer'dalis romance, Sarevok romance and Xan NPC. I had Jaheira, Minsc and Yoshimo in the party. The banter that seemed to be cutoff started with Jaheira telling Yoshimo to stop directing his eyes her way; that was the only part that played, her telling him to stop looking, then it just ended. He spoke up just fine in dialogue with out-of-party NPCs like Saemon or Renal, and stuff like his "better go talk to Renal" upon entering the docks fired perfectly. Everything at Spellhold went as it normally does, though I only played up until Irenicus did his little soul-stealing bit and the Candlekeep dream sequence started. Sorry, I don't have a save... I can reinstall and start a new game and get a save for you at whatever point you'd like, though. Oh when I got that error that was two versions ago, I was just saying its fixed for me now. Hi, I got the same problem as Sed, but somehow v0.89 doesn't fix it in my case. I tried installing and uninstalling the mod several times. Doesn't help. I've installed these mods: Imoen friendship, de'Arnise romance, Edwin romance, Sarevok friendship, Back to Brynlaw, Unfinished business, Xan NPC, Isandir portraits mod, Fade NPC. Still, thanks for your good work. Hi @wuthering20‌, I'd like to have a look at your saved game, could you please zip/rar the one with this issue (make the game auto-save if you can't save normally) and another one before it? Saved games are in Documents/Baldur's Gate II Enhanced Edition/save, and they are composed by the whole 000000## - Example folder. Also, please zip/rar the files YOSHIMO.BCS, YOSHIP.DLG and YOSHIJ.DLG from the 'override' folder (which should be in the same directory as the CHITIN.KEY). Alright, I found and fixed that one by now, it'll make it to the next version (probably later today). Wow, I got the constant talking + katana unusable problems yesterday and posted a comment here. Somehow today when I recruited Yoshimo again (because with that bug I can't keep him in the party), the former problem disappeared! Now the only glitch is that he can't use his personal item. Still, I attached my save and YOSHIMO.BCS (I can't find other 2 files, sorry) below if you want to check. I'll continue playing to see if it happens again. Thanks. OK, new version 0.9 is here at last! Thanks to everyone for testing the mod (and reporting the errors )! Seems I somehow missed them! Can you shed some light on this? Thanks. @wuthering20 Last I can recall it (and this was a long time ago) from the original version it was supposed to happen after Imoen and Yoshi have rejoined, but before the mage duo encounter. However, I can't recall anymore specifically what triggers his confession... Did you fight the two mages? The trigger for the mage duo battle is now dependent upon XP level, I believe. Anyway, @CrevsDaak can tell us since he's the coder. wait... what? Why would you do that? Unless I'm missing something this is completely unnecessary. Please list all things you are gaining by this messy solution. @swit‌ only way to keep him in ToB without modifying the executable. Next version will patch the executable on Mac and BG2:EE too (IF I get the time, it might get released in around a week). There were some mistakes on everything regarding Yoshimo's dialogs. I made yet another mistake which caused none of them to trigger but all should be fixed in the latest version (v0.9 beta). New (beta) version 0.91 is here! already old! Use the new one blow this post!